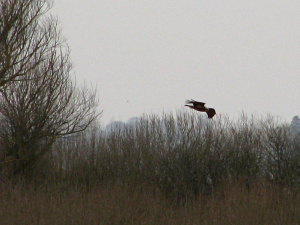 Observation - Marsh Harrier? - UK and Ireland. Description: Two birds seen, in poor light and strong easterly breeze. Terrible photo, I know. New photos added 3rd April - slightly better ones. Two birds seen, in poor light and strong easterly breeze. Terrible photo, I know. New photos added 3rd April - slightly better ones.